With thanks to my sister, Judy, I have discovered a new homemade energy treat that offers a sweetness, but is not particularly high in sugar. One reason it is a low sugar snack for me is, my ability to be satisfied with a single serving. I can get a batch to last more than a month, barely eating one per day. What makes them so satisfying? 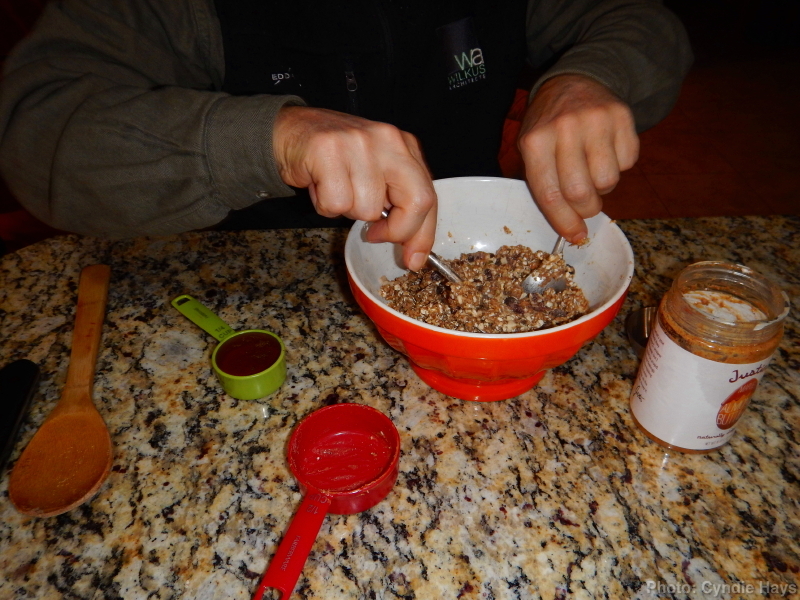 I think it is the brilliant balance of ingredients, including crunchy peanut butter, honey, oatmeal, and as of last night, a few of my own enhancements. With Cyndie’s guidance in the kitchen while making dinner, I concocted a souped-up version of the recipe Judy originally shared with us. Per Judy’s suggestion, we replaced raisins with craisins. 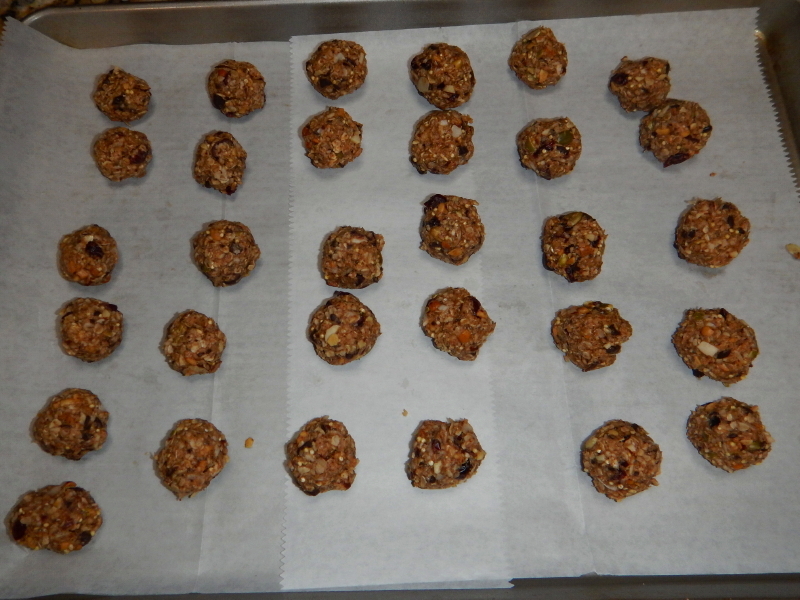 Beyond that, I added some millet, chopped coconut, chopped almonds, chia seeds (because Cyndie found some in the cupboard), protein powder, and chopped pumpkin seeds. Finally, as much as I love crunchy peanut butter, I reduced the quantity and finished the amount with the addition of almond butter. If there is a “super crunch” version of almond butter, I haven’t discovered it yet. I would dearly love to try that. Cyndie did the honors of buttering her palms and forming the bite-sized balls for me. I’m not that interested in getting my hands covered with ingredients. She shaped these a tiny bit bigger than a previous batch she made from the original recipe. Even when small, my method of enjoying them involves nibbling to get many more bites than one per serving. At this size, we calculate a single ball is about 3-4 grams of sugar. The average cookie often comes in around 7 grams. I’m still aiming to stay below 50 grams per day in my average 2000 calorie/day diet. By trying to stay close to 10 grams per meal, I have almost 20 grams of space available each day to keep from being a total party-pooper when treats are served. Having a choice available with only 4 grams of sugar gives me a quick and easy option and helps me land well below my goal on days when these are the only treat I end up eating. Of course, this would never have satisfied my old palette, when my sugar addiction was allowed to direct my choices, uncontrolled. Having weaned myself off the high sugar diet, I am now able to get sweet satisfaction from much lower amounts. It is a great reward to have arrived at a healthy pattern of eating and find out it no longer feels like a place of deprivation. It is perfectly pleasurable and sustainable, as long as I acknowledge and remain vigilant about paying appropriate attention to my history of addiction to the sweet reward my brain celebrates every time I give my body sugar. I’m a little behind where I prefer to be with staging firewood for a year away, so today we took a hint from the snowy weather and gave the shed some overdue attention. First, we started by stocking the wood rack on our deck with this year’s firewood, which cleared out the last of the space on the left side of the wood shed. That allowed me to put new pallets in for a floor where I had previously used wood blocks. 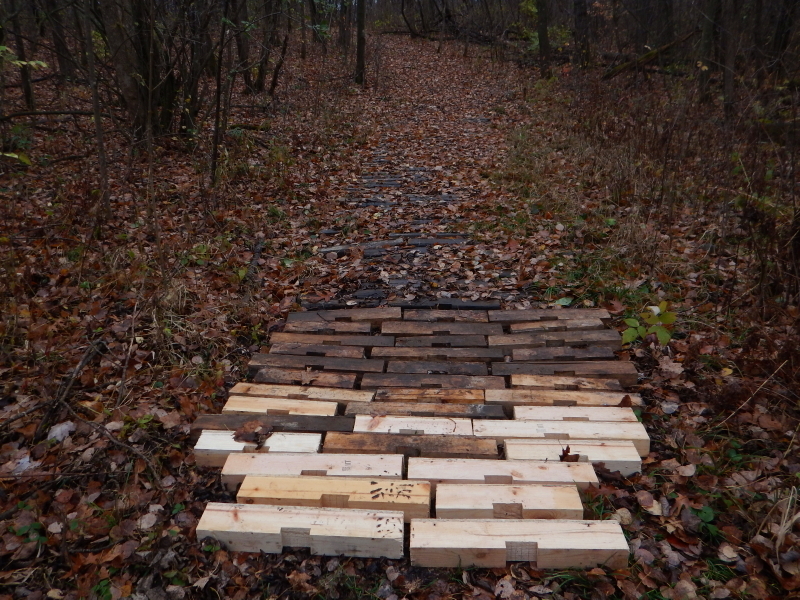 After digging out the old blocks, and pulling similar ones off the new pallets, we hauled them down to the woods to use on our trail. As far as projects go, these were pretty small steps, but accomplishing them provided a large psychological boost. 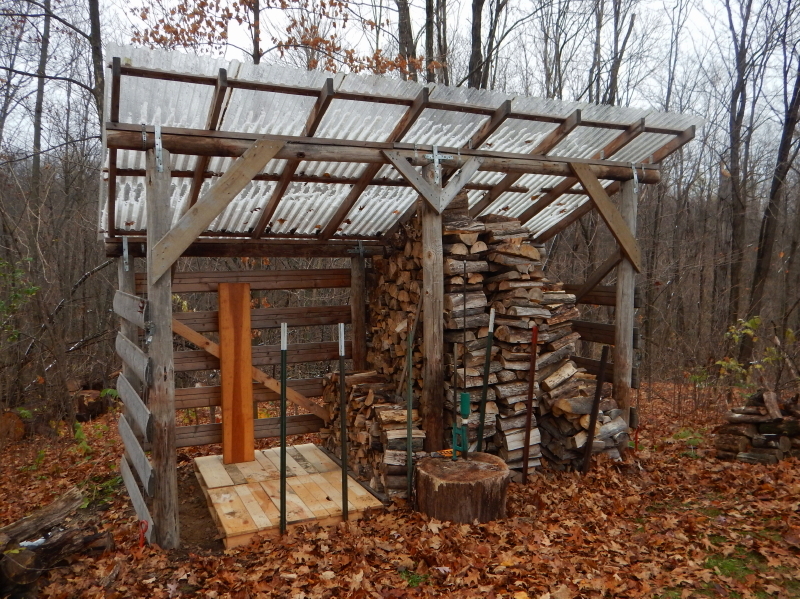 It paves the way for me to focus exclusively on splitting and stacking firewood to fill the rest of the shed. Achieving that is a goal I’d like to complete in November. Somebody remind me in about a month that I wrote this here. It is common to hear the term “watchdog” for a dog that guards property, but I’m finding our “lookout horses” surprisingly valuable in alerting me to activity on our perimeter. Over time, my interpretation of their equine reaction to the environment has changed from one of superiority to one of much more humble respect. I used to think the silly horses were just being hyper-sensitive when they startled over triggers to which I was oblivious. My response early on was to try to assure the horses that there was nothing to worry about. Like I knew better than them. With enough repetition, I began to learn that I was not more fully aware of reality than they were. Last week, as I was beneath the overhang, the horses suddenly all turned around and looked out in the exact same direction. My eye quickly spotted the movement of our neighbor on his riding lawnmower. Chuckling at their intensity over this innocuous activity, I spoke to assure them the mower wasn’t worth the attention. Yet they didn’t sway from their focus. I stood with them and watched the mower, barely visible through some trees, and suddenly movement in the much closer cornfield caught my eye. The horses weren’t looking at the mower at all. I had a split-second view of a good-size deer as it hopped over corn stalks. 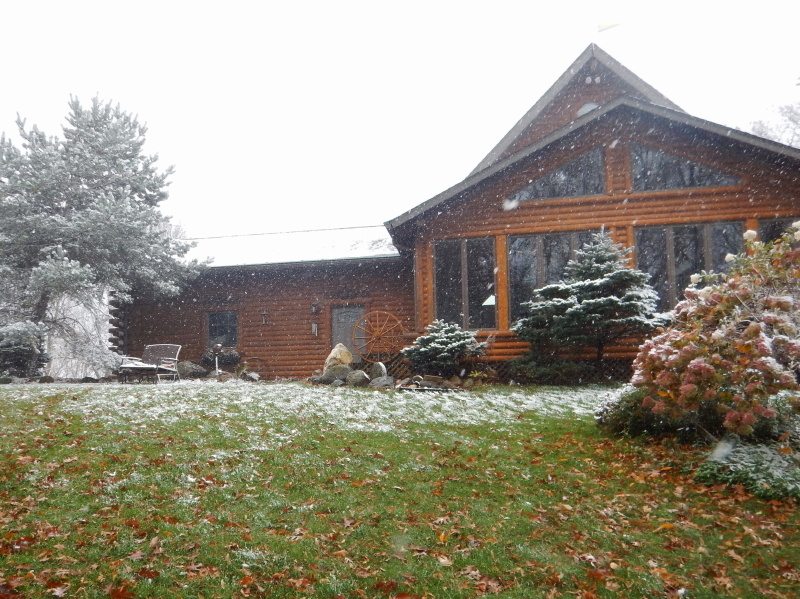 As expected, snow showers blew in yesterday. Windy, wet, sticky snow battered the ranch for most of the day. For the most part, we were prepared. 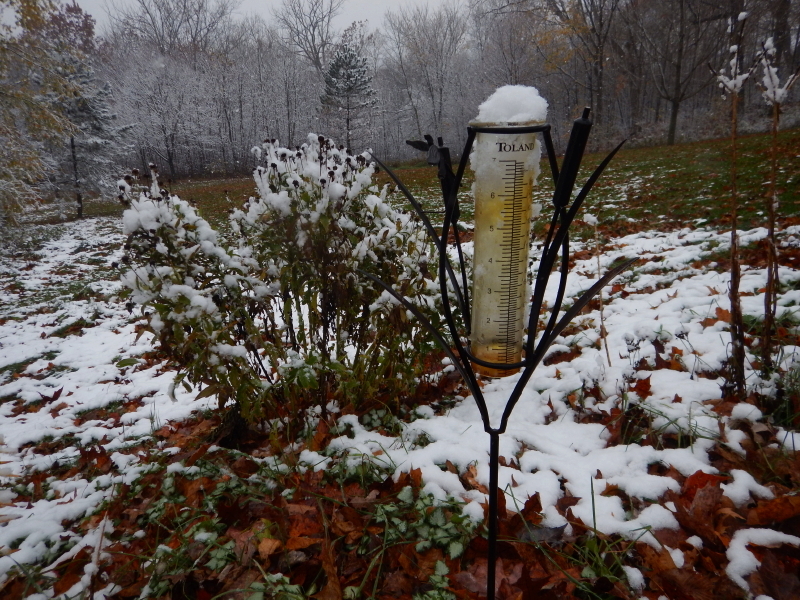 The rain gauge wasn’t doing us much good anymore, so I brought that in, after the fact. There are plenty of leaves on the grass that I would have preferred to have removed in advance, but that’s a trivial concern. It was certainly beautiful to look at. 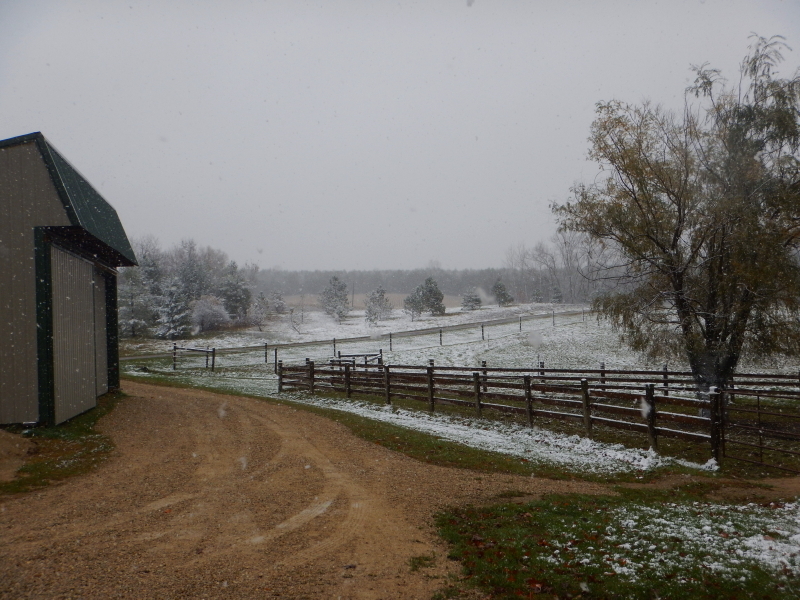 Conditions varied from blowing tiny flaked drizzle to snow-globe gorgeous throughout the afternoon. After Cyndie let the horses out of the barn, they stayed hunkered down under the overhang, except for individual brief sorties down to the waterer and back. When I was mucking out their stalls in the middle of the day, I would take breaks and lean on the half-door to watch them. 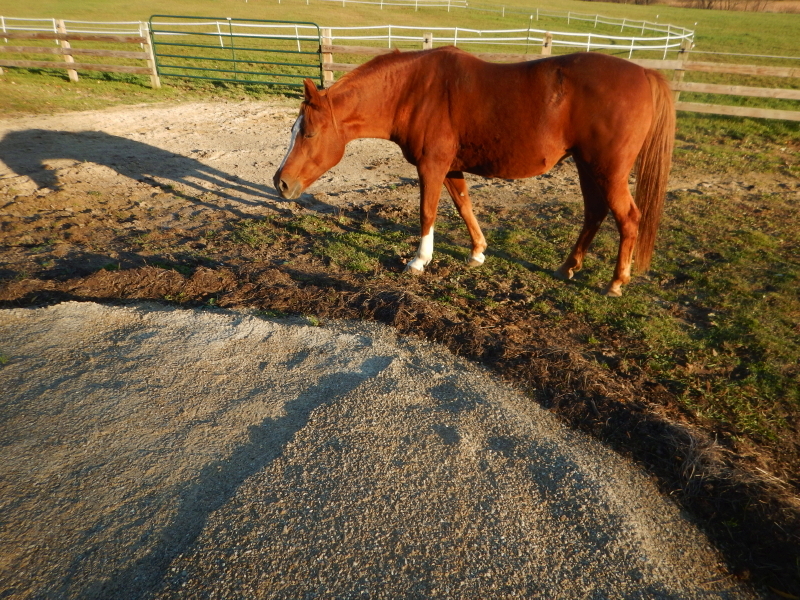 I caught Legacy standing in a spot where his head was out from beneath the protection of the overhang. It looked like he was trying to wash his head and mane. Before heading back into the house, I walked the driveway and took a bunch of pictures as the flakes flew. Unfortunately, I didn’t notice that one of the wet globs stuck to the camera lens, creating a blur in the middle of most of the shots. The snow added a nice accent to our Halloween decoration near the front door of the house. 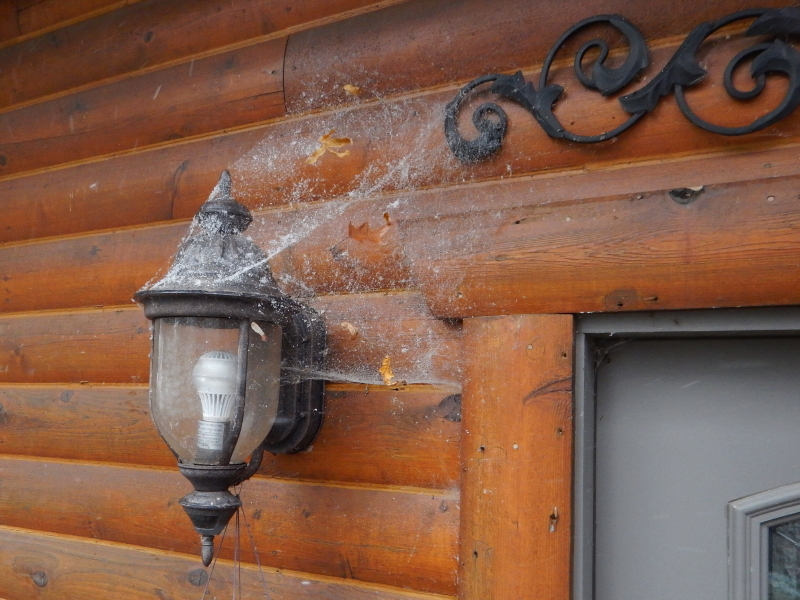 Some people put up fake spider webs to make things look spooky. We have the real thing. Basically, we are all good, but there are some health concerns that continue to linger for some of the Wintervale crew. Time has not healed all wounds. After the most recent hoof trimming, Cayenne’s showing a tiny bit of improvement. What we cling to there is that she is, at the very least, not worse. She still shows a fair amount of hesitation on her movements, but she doesn’t appear to be in extreme pain. It’s possible she may have developed a habit of anticipating pain, and she still limps because that is what she has grown used to doing. It sometimes looks like she steps gingerly to protect herself, not because it hurts too much to walk normal. Now, Delilah, on the other hand, is behaving quite the opposite. She keeps trying to act like she is fine, but continues to have moments of extreme pain. On Tuesday, we resorted to ordering x-rays of her spine and a more thorough blood analysis. The results of her blood work are not in yet, but the x-ray showed a minor compression between discs 3 and 4. We were told there also appeared to be some abnormal marks or possible lesions on those vertebrae, which the vet is hoping the blood analysis will inform. We have returned to restricting her movements to a bare minimum. Regardless, she continues to maintain a pretty happy attitude between moments of looking like she’d prefer to do nothing more than lay down and convalesce. It’s been a long summer of rehabilitation for Cyndie’s shoulder, but it’s not over yet. She continues to have regular physical therapy appointments to improve range of motion. The good news after her most recent follow-up with the surgeon was that he deemed it unnecessary to put her under and break the scar tissue by force. The bad news was the alternative being extended PT with painful aggressive measures to do the same thing. 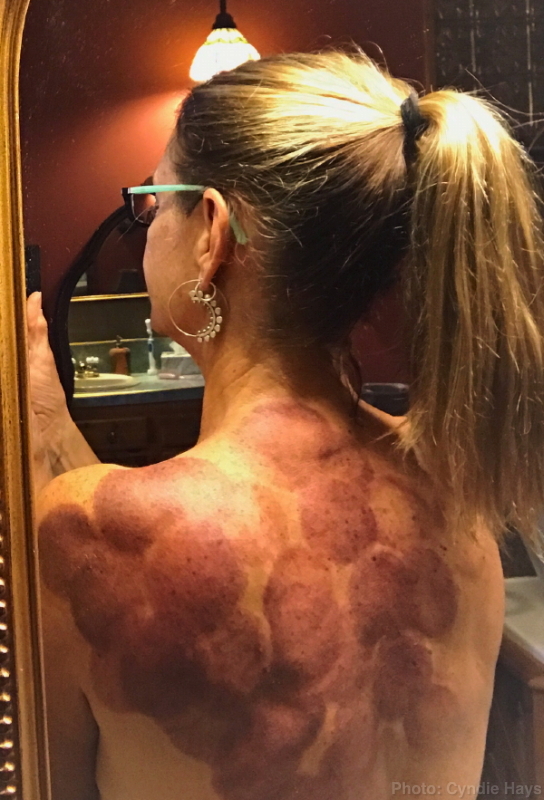 The therapist used the infamous “cupping therapy” to stretch the scarred tissue across the grain. Makes sense to us, despite a broad belief that cupping is pseudo-science and any benefits are from a placebo effect. Cyndie is growing tired of the pain from her exercises and the ongoing need to push her limits of stretching and rotation. At the same time, she continues to find ways to function in her daily activities with only minor limitations. The rest of us are enjoying a grace period of good health. The chickens will be seeing snow for the first time in their lives. Pequenita is happy to be an indoor cat. We brought the horses in out of the windy wet precipitation last night, but we’ll give them a short shift outside for some fresh air before letting them back into their stalls again tonight. I avoided hitting any deer on my commutes this week. Yesterday morning, I was lucky to not be a part of a 10-car chain reaction crash, –nor get caught in the significant backup of traffic behind it– when a vehicle hit a deer on I94, right at the bridge between Wisconsin and Minnesota. I had already passed that spot and was well on my way to work by then. Everyday I don’t hit a deer in October and November is a successful day. That’s my update on how everybody is doing today. We are thankful for all our good fortune. 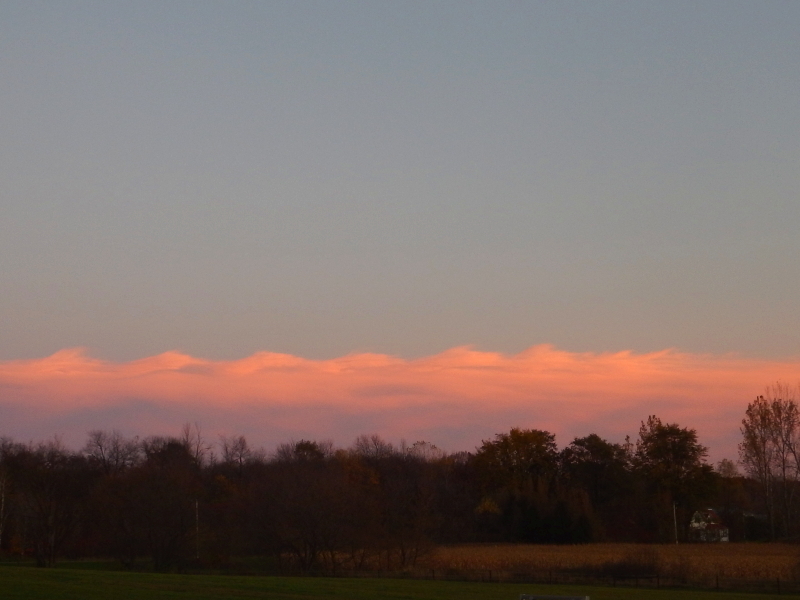 The sky has been treating us to a nice variety of cloud edges recently. Here are three I was able to capture that represent the range of views we get to enjoy while toiling away on our chores. 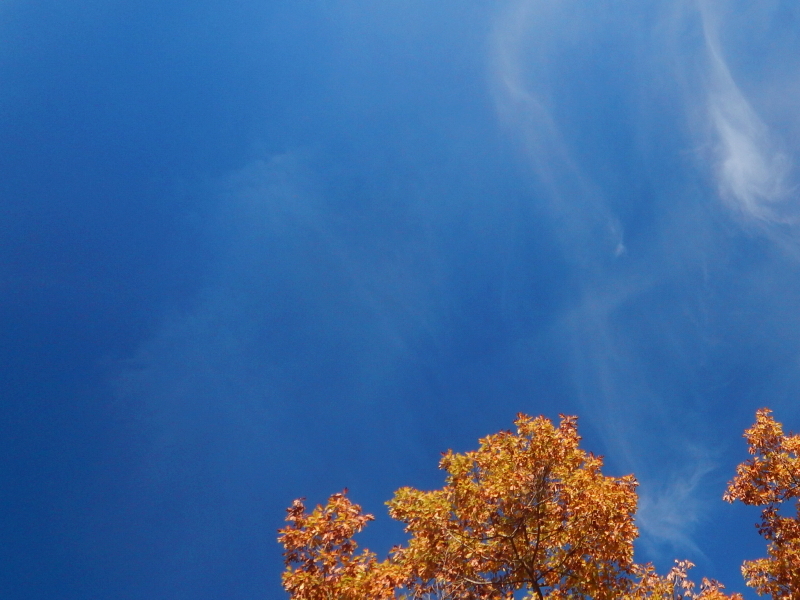 According to the weather forecast, our blue skies are about to change to snow clouds. Cold and wet is a condition for which we move horses indoors to the shelter of the barn and their stalls. Thus begins the season of wood shavings added to the compost heaps, which significantly increases the volume of space occupied. It’s also the season of plowing and shoveling snow, hauling firewood, and eventually, building igloos. Snakes disappear. Mosquitoes disappear. What’s not to love? In a couple of months, it will even be winter. A very fitting season for Wintervale Ranch. After setting out a pan of feed for each horse after work yesterday, I walked down to close the gate to the hayfield, passing by the raised circle I had covered with lime screenings just over two weeks before. It’s a little surprising to me that the horses had, for the most part, stayed off the new covering. There were just a couple of light hoof prints from one horse where it had tested a small portion that had been tamped down by my feet. The majority of the circle had been left to cure naturally in the rain and sun, because I didn’t have the time to press the rest of the area out, one little boot print at a time. Suddenly, I felt moved to spontaneously pick up where I had left off. While they munched on their feed under the overhang, I meticulously began a ridiculous dance of baby steps across the circle. Occasionally, I would resort to hopping up and down in order to put increased pressure on spots that seemed to need it. 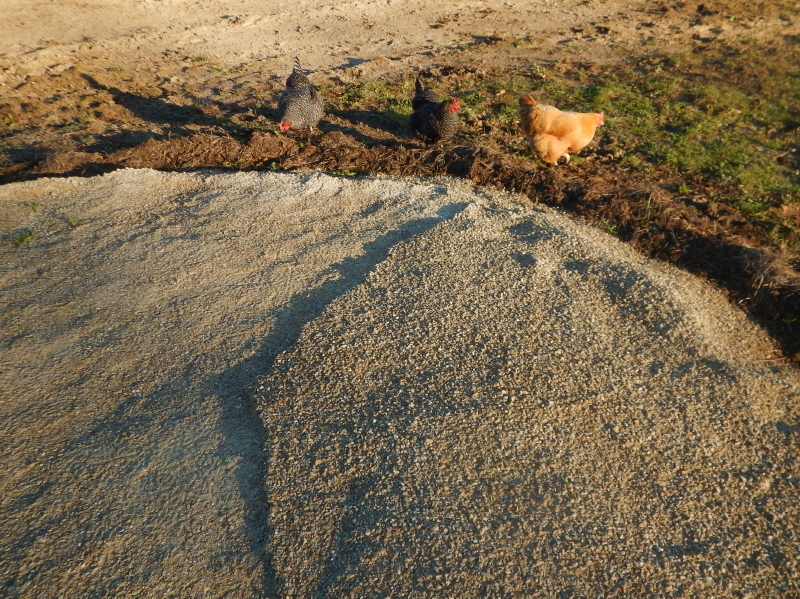 Always curious about every project we get involved in, the three chickens quickly arrived to investigate the scene. The flat lime screenings didn’t appear to harbor any crawling creatures, so they busied themselves with the dirt around the perimeter. 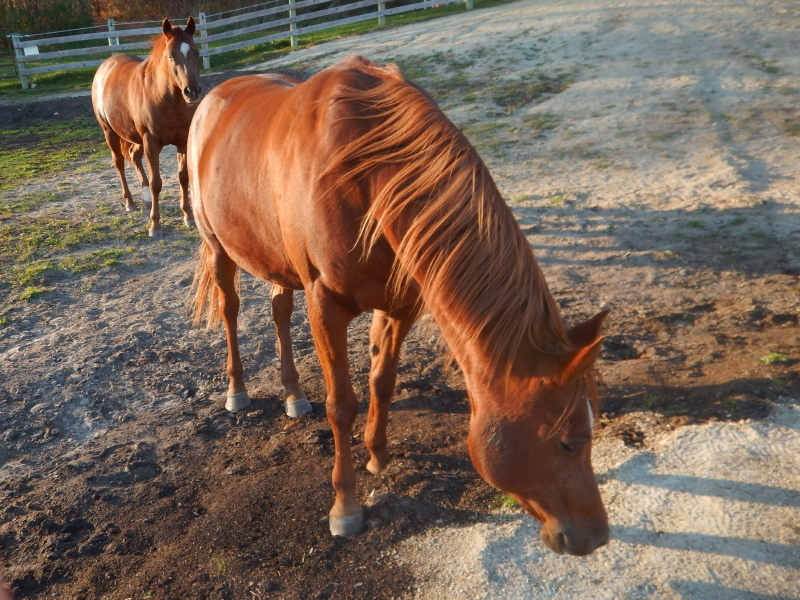 A few blinks later, I gained an audience of horses, apparently just as curious with my mysterious project. Luckily, they also maintained a cautious step away from interfering with my gyrations. At about ten times my weight, they would easily cause more disruption than compaction to the relatively new surface. If they can stay off of it until the freshly pressed screenings have another chance to bake in the sun for a few days, there is a chance it will support them without getting all pockmarked. Actually, what would be really nice is, if they would lay down and roll around on it. That’s not too far-fetched a possibility. I’m guessing it will look like an attractive option, once they are convinced it’s safe to walk on. 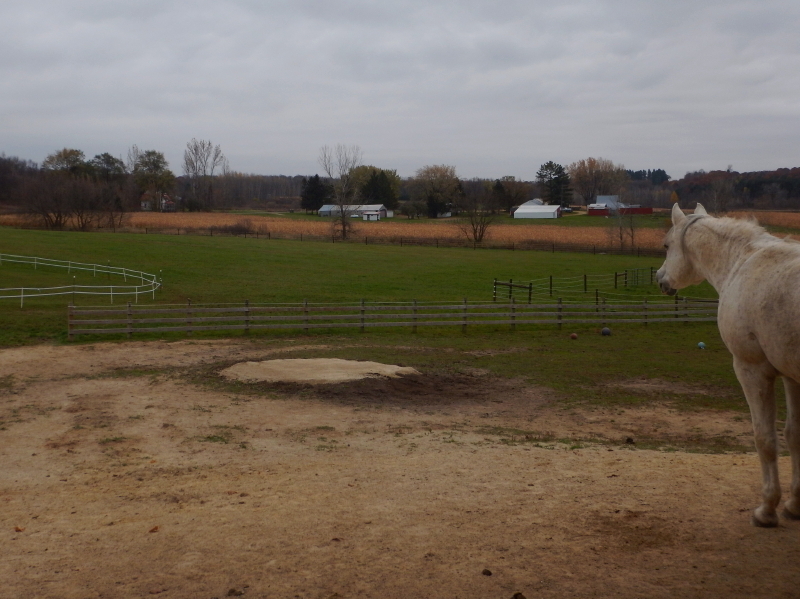 Eventually, the horses and chickens left me to my odd behavior. I hopped and baby-stepped until the entire circle had been compressed by what little force I could generate from my small frame. A little victory in the grand scheme of things deserving attention. 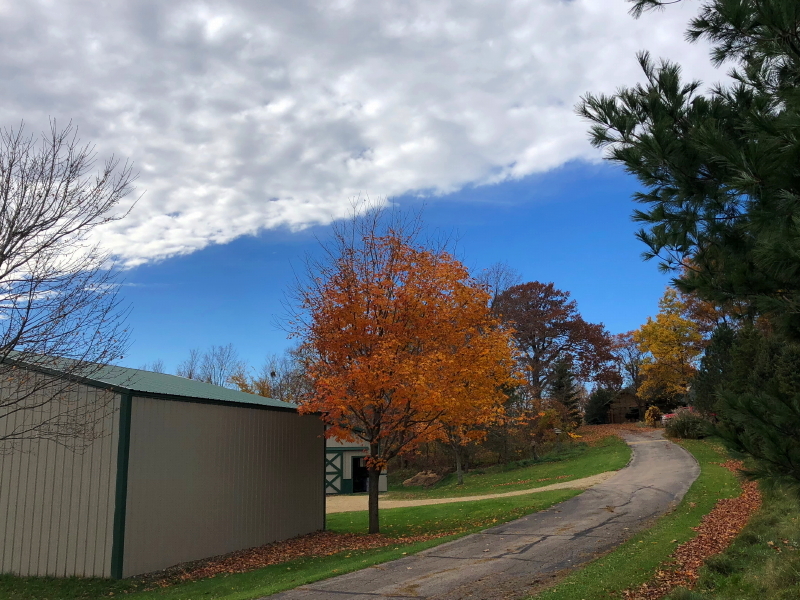 Add to that, getting the windows re-installed on the chicken coop, and taking down the tarp that covered the gazebo, and we are starting to round the final turn in the slow race of preparation for winter. For those keeping score, we are expecting some snow will be mixed in with rain that is due to visit us tomorrow and the next day. Now that I think of it, I guess that circle won’t really be getting baked hard as cement any time soon.